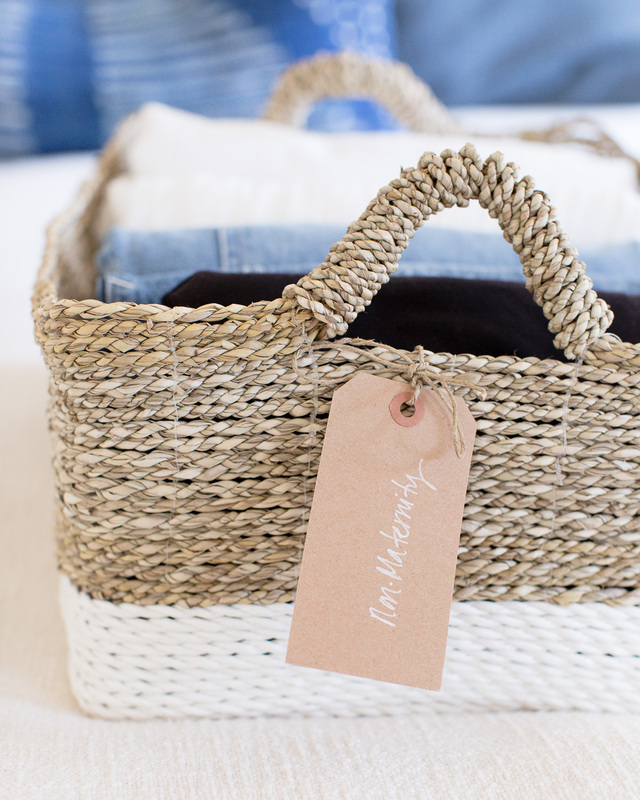 Organizing your clothing during the 9 month pregnancy journey doesn’t have to be a big deal. I made a few simple swaps with my closet and dresser drawers and was able to get dressed with more ease. Did I wear many of the same things over and over? Yup! Knowing that my pregnancy wardrobe would only be around for a limited amount of time, I made peace with keeping it simple in those early months. I will admit that I did wait too long to organize my clothing and kept finding myself frustrated when the white t-shirt I was looking for was no where to be found. 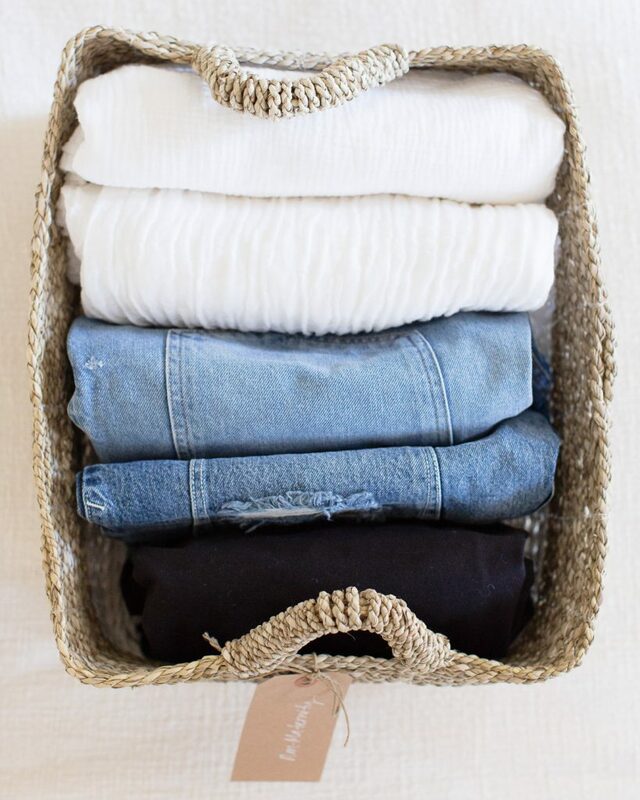 With a little bit of creativity and rearranging, getting dressed will get easier and easier. 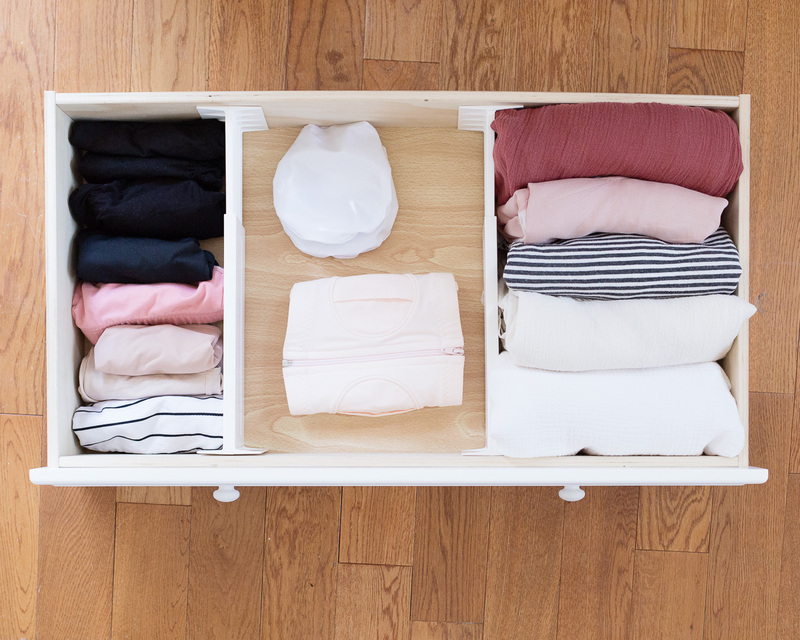 Read on to see how I organized my closet and dresser during my the time I was pregnant! Once my body got too big to wear my regular undies and bras, I took them all out of the drawer and replaced them with my maternity and postpartum ones. I’m living in my belly binder and nursing bras now, so having everything in one single drawer is making my sleepless days and nights that much smoother. I rearranged a few dresser drawers so that all the things that don’t currently fit me are all together (work out gear, tee shirts, tanks, etc. 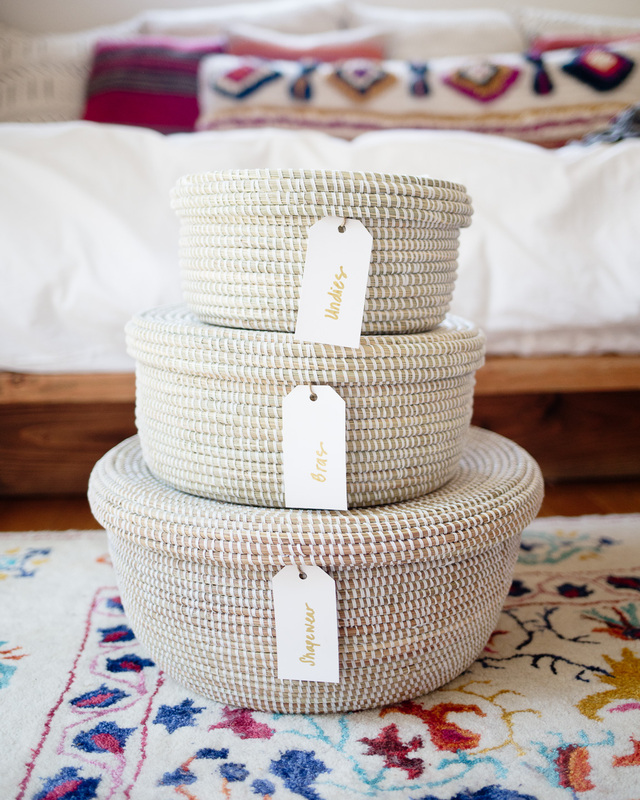 ), however, the smaller underpinning items were cleverly stashed in these beautiful nesting baskets from Connected Goods. 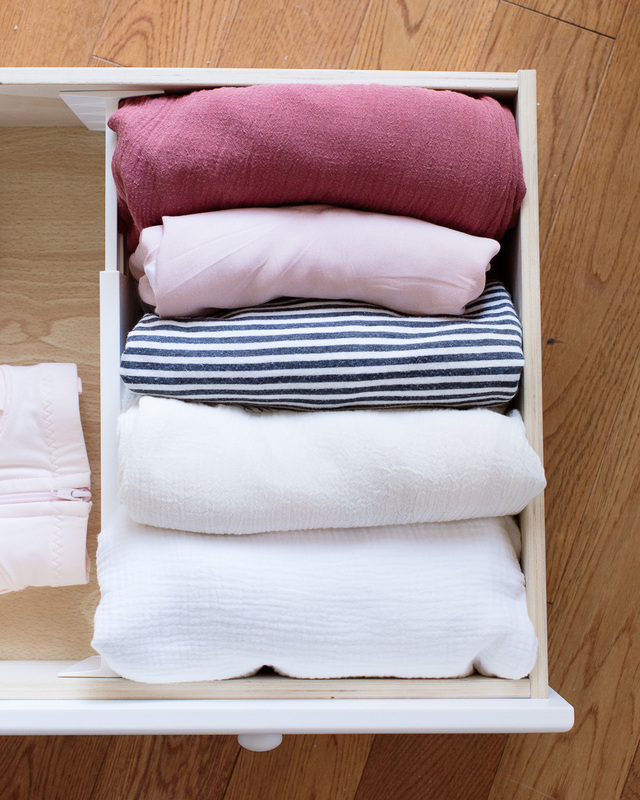 Tip: your little one’s dresser or closet may be the perfect place to temporarily store some of your non-maternity clothing. I moved a bunch of my dresses to the nursery closet as there was tons of space on the hanging bar. Newborns tend to not have that many hanging clothing items. You might consider utilizing an empty dresser drawer or closet shelf in the nursery as a temporary storage place as well. Once again, file folding and drawer dividers are the name of the game. Designate one drawer with items that will most likely go together. For instance, I used this drawer for bralettes, nursing bras and pads, nursing nightgowns and pajamas. 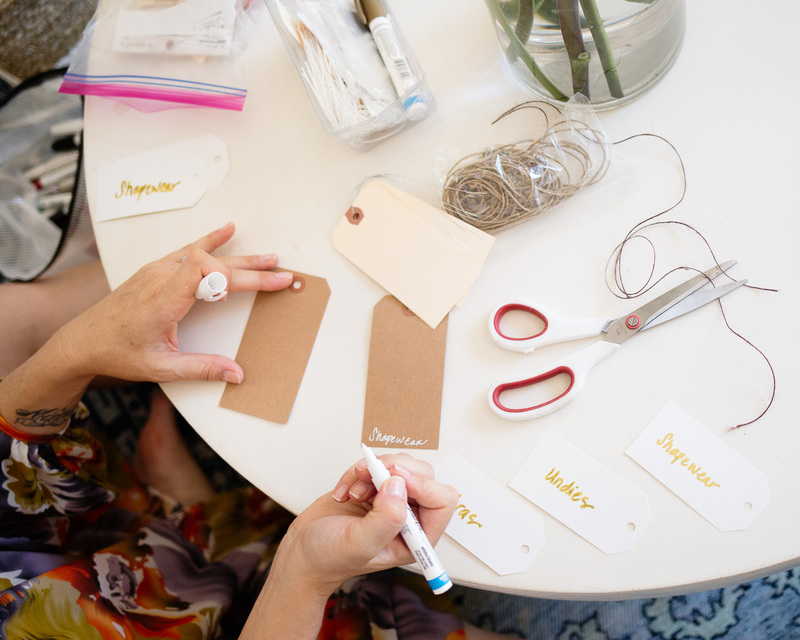 My organizing materials stayed the same, which includes and labels to keep items easy to find when the time comes! If you have the space in your bedroom, a free standing clothing rack comes in handy! 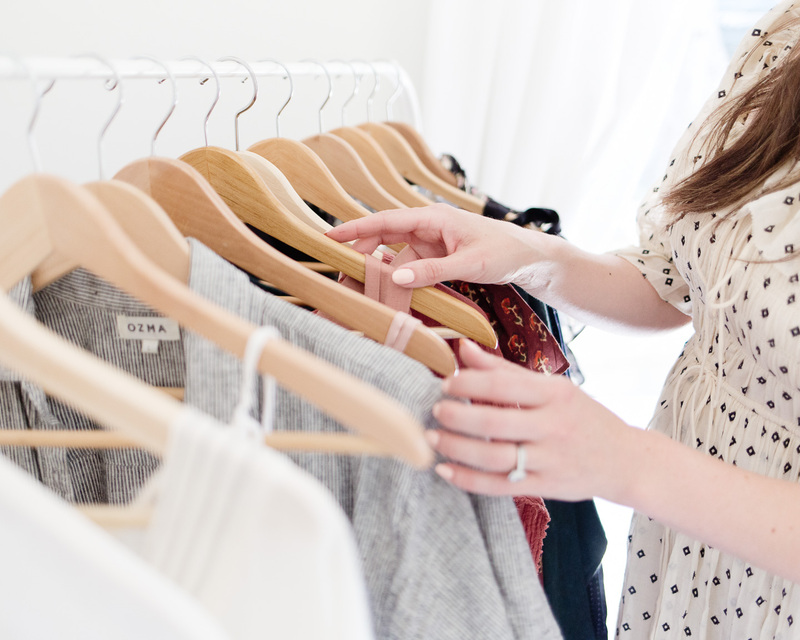 Use the rack for your pregnancy wardrobe or to plan your outfits for the week! A chic and affordable option is this Ikea one. I not only love the price point, but the minimalist design allows your clothing to shine. If your closet needs decluttering and organizing, Clutter Healing® would love to help! Send us an inquiry here.